Too many pests and diseases, and too little cash. Cuts to the city’s budget are making it hard to battle nature’s attacks on Winnipeg’s green canopy, says a pair of councillors. Black knot and Dutch elm disease are two of the biggest threats. This year, the city has allocated $250,000 to fighting black knot disease, which is believed to have infected every one of the city’s 7,843 chokecherry trees. That’s down from $500,000 in 2014. Black knot leaves chokecherry tree branches covered in dark, ugly swellings. St. Norbert Coun. Janice Lukes estimates the city can remove only about 200 trees per year infected with black knot with the most recent funding. The budget to battle Dutch elm disease is more complex because it involves both tree removal and tree banding. 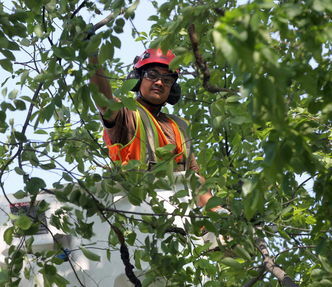 The province also chips in to fight Dutch elm disease. The city is budgeting $3.9 million in 2015 to fight Dutch elm disease, versus $5.6 million in 2014. The city removes about 5,000 infected elm trees a year. City forester Martha Barwinsky said the only solution to battling black knot and Dutch elm is to remove infected trees, which costs more money than is being allocated. “It is about concerns being raised from citizens, we had a town hall meeting… and councillors Brian Mayes and Janice Lukes were trying to get information out there to citizens and get their reactions, to find more money for that (black knot) program,” Barwinsky said. The city has allocated $4.8 million for tree pruning and removal in 2015, down from $5.1 million the year before. Mayes (St. Vital) said the lack of funding is slowing down the city’s ability to fight black knot. There is also a concern about the emerald ash borer, a beetle that destroys every tree it invades. Barwinsky estimates there are almost 300,000 ash trees that would be in danger if the beetle reaches Winnipeg. The beetles burrow into the trees, slowly killing them without detection, meaning a population could be established throughout an area without the city’s awareness. So far, the beetle, which is native to Asia, has made its way to Minnesota, Ontario and Quebec. “Right now they (those areas) are managing the mortality of the trees, they are doing everything they can just to slow down the rate of loss,” Barwinsky said. Preventing the disease from spreading is also about public education, she said. Wood should not be transported from out of province, she said, and tools used to remove diseased trees need to be sanitized. Traps are set up throughout the city to catch the beetles, but so far none has been caught. The city has been managing Dutch elm disease for almost 40 years, with about 275,000 elm trees counted on city property by the branch in 1975. Winnipeg now has half that number on city property, but elm trees on private property have helped boost the city’s actual inventory. “But we are still losing 5,000 elms on average every year,” Barwinsky said, noting some years the numbers have reached 10,000. After 15 years in the business of removing trees, both for esthetic purposes and due to disease, Doug Panchuk, owner of Shurwood Forest Tree Service, said residents need to work with officials to keep the tree population healthy. “We are extremely blessed to have this urban forest that we have, but both privately and publicly, we need to maintain it as our forest ages,” he said.